As we look toward the future, NSU College of Pharmacy continues to make strides towards transforming the profession of pharmacy and conducting state-of-the-art research. Our faculty members and students are recognized in research, scholarship, advocacy, and academics. This fall we will introduce a new Entry-Level Pharm.D. curriculum designed to educate future pharmacists and researchers. We continue to push boundaries and look for new opportunities to collaborate with other universities and research organizations. 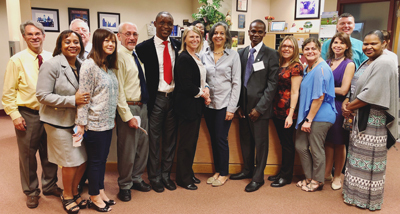 In February we hosted two pharmacists from the University of Ilorin Teaching Hospital, Nigeria, as part of our mission and commitment to positively impact pharmacy education and improve global health. Our alumni continue to be the cornerstone of our successes, and their participation on committees and in leadership roles in national organizations continues to provide greater visibility to the college. As a college we continue to develop our vision, take risks, and embrace innovation. NSU College of Pharmacy is a dynamic and exciting place to study and work! 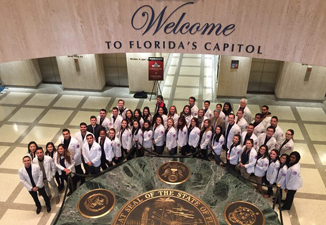 In January, 43 students and 7 faculty members attended the annual Florida Pharmacy Association Legislative Days in Tallahassee, FL. Each year the college supports students to go to the event to attend informational sessions, meet with and speak to state senators and legislators about the profession of pharmacy, and advocate for pharmacists’ roles to be expanded in providing healthcare to patients. In addition, faculty and students participate in the health fair providing medication education, cholesterol screening, glucose levels, bone density, and blood pressure under the guidance of faculty members. Class of 2020 Pharm.D. student pharmacist Denis Abelpeysov described the experience as “incredible...I sincerely treasure opportunities like these”. The College of Pharmacy Student Government Association (SGA) held a fundraising BBQ to offset expenses. In November, the College hosted the United Stance, an “all-hands-on-deck” approach to solving the nation’s opioid epidemic. The event was moderated by Scott Kjelson, Pharm.D. (‘14), and included representatives from local and state government, legal and medical experts, as well as concerned citizens. The event was co-sponsored by Greenspoon Marder, P.A. A highlight video of the event is available at United Stance Symposium. In addition, COP faculty researchers Hossein (Hamid) Omidian, Ph.D., and David Mastropietro, Ph.D., are featured in NSU Horizons Fall 2017 magazine fighting the opioid epidemic. The epidemic is sweeping the United States, and researchers at NSU COP are working to make dosage forms that are almost impossible to crush into a powder. To hear more about what NSU COP is doing to prevent drug abuse by snorting, injection, and oral ingestion click here. NSU is seeking collaborative partnerships and licensing opportunities to bring new abuse-deterrent technologies in the pharmaceutical market. Contact us at copdean@nova.edu to get involved. The College hosted its annual Preceptor Fair at the Fort Lauderdale/Davie and Palm Beach campuses in November 2017. The fair, the largest ever, hosted over 90 preceptors at both campuses. Students were able network and to learn more about IPPEs and APPEs available at the site, and preceptors answered questions on expectations, requirements, and outcomes providing valuable information needed to select and rank sites for upcoming experiences. Walgreens Community-Based Pharmacy Residency Program, in partnership with NSU College of Pharmacy, will provide the successful resident with the opportunity to develop academic skills, act as a preceptor and educator, and conduct research. The successful resident will actively participate in the education of Walgreens pharmacists, technicians, pharmacy students, and the community at large. The program will prepare graduates for clinical and leadership positions in the community and specialty pharmacy-based programs. For more information on this and other residency opportunities with NSU COP, visit NSU COP Residencies. The ShadowRx Program is the college’s official pharmacy shadowing experience. The goal of the Program is to have student pharmacists experience a day in the life of a pharmacist. There are now over 70 ShadowRx mentors available across south Florida to mentor students, and new mentors are continually being recruited. This is a great opportunity to network, get hands-on experience, and possibly future professional opportunities. To join the program as a mentor or student contact CareerRx@nova.edu. 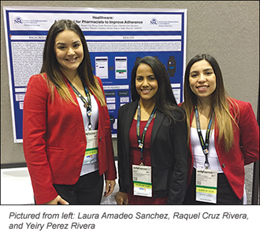 Despite the challenges experienced by students in Puerto Rico following Hurricanes Irma and Maria, Puerto Rico Class of 2018 students Julia Gonzalez, Zaret Velez Estremera, Laura Amadeo, Raquel Cruz, Yeiry Perez, and Yamitza Ortiz presented posters, and stories of positivism, describing how they found strength despite adversity. A big thank you to the American Society of Health-System Pharmacists (ASHP) who provided 10 complementary registrations to fourth year Puerto Rico students attending the midyear meeting. To read more about this extraordinary group of students click here. In a “battle against breast cancer” fund raising drive during October, the College of Pharmacy Student Government Association sponsored a battle to see which class could raise the most funds. 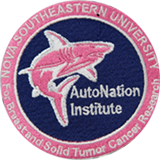 A total of $850 was raised and donated to the AutoNation Research Institute for Breast and Solid Tumor Research. The winning class (Class of 2019) received an SGA sponsored breakfast. 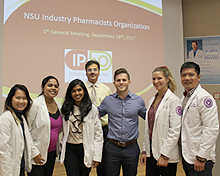 The Industrial Pharmacist Organization (IPhO) Student Chapter held its first general meeting in September 2017. The chapter is dedicated to raising awareness among students about career opportunities and fellowships within the pharmaceutical industry as well as enjoying social events together. Activities promote advocacy and leadership in the pharmaceutical industry. Past guest speakers Nikeshia Dunkelly-Allen, Pharm D., from Rutgers Institute for Pharmaceutical Industry Fellowships, Ms. Candace Lerman, NSU-Law student and Independent Patient Advocacy Lobbyist, and Scott Kjelson, Pharm.D. (’14), director of student transitions, provided valuable information for the members. For more information about this chapter contact faculty advisor Mutasem Rawas-Qalaji, Ph.D., or Parvathy Varma, (’19), student president of the chapter. Pictured are officers of the organization with faculty advisor Mutasem Rawas-Qalaji, Ph.D., (center back) and guest speaker Scott Kjelson, Pharm.D. Congratulations to the 91 College of Pharmacy students invited to become inaugural members of the Phi Kappa Phi national honor society. Membership is by invitation only to the top 10 percent of college seniors and graduate students and the top 7.5 percent of juniors. The new chapter will enhance NSU recognition and recognize our top academic achievers. The initiation ceremony for NSU’s Chapter 345 will take place on February 20, 2018. Click here to read more. Ana Hernandez Diaz , (’19) from the Class of 2019 in San Juan, Puerto Rico is the winner of this year’s Class Pin. The pin will be given out to members of the Class of 2019 at the annual Pinning Ceremony. Hernandez Diaz receives a $50 gift card for her winning design. Congratulations to Elizabeth Sherman, Pharm.D. (’07), on the publication of the text “HIV Pharmacotherapy”. Sherman is also a section editor and chapter co-author with colleague Marylee Worley, Pharm.D. This is the first comprehensive HIV pharmacotherapy reference textbook. 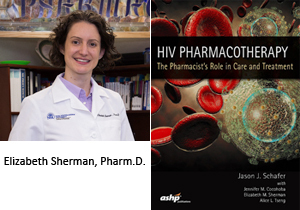 This consolidated resource, published by the American Society of Health-System Pharmacists (ASHP), is designed to assist pharmacists, pharmacy residents, and student pharmacists in delivering comprehensive care to patients with HIV infection. Pharmacists have long been recognized as essential members of the HIV healthcare team and their involvement continues to improve patient outcomes. The pharmacist's role is expanding with a focus on providing comprehensive care to all patients with HIV infection. This textbook creates a unified resource for pharmacy professionals treating people living with HIV. The book is available from ASHP's bookstore. 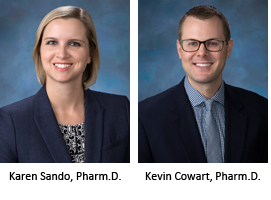 Karen Sando, Pharm.D., associate professor of pharmacy practice, and Kevin Cowart, Pharm.D., assistant professor of pharmacy practice, completed a Podcast and written commentary on iFormuRx titled: “SPRINTing towards lower BP goals: A re-analysis of the ACCORD-BP trial”. The commentary and podcast provides a critique of a research article and reviews how to apply this evidence for treatment of hypertension in patients with diabetes. Read the commentary and listen to the Podcast here: http://www.iforumrx.org/node/394. 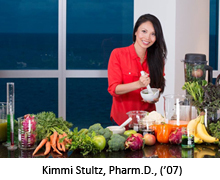 Kimmi Stultz, Pharm.D., (’07), director of preceptor development, was invited by Ivanka Trump’s PR team to contribute an article to Ms. Trump’s lifestyle brand website. To read more about how food can help you to better health, click here. Gilmer Bautista, M.S., joined the sociobehavioral and administrative pharmacy department as administrative coordinator I, providing administrative support to the faculty. Bautista completed his M.S. in agricultural sciences with a minor in computer systems at the University of Florida. Oren Elharar, Pharm.D. (’14), started as instructor/academic facilitator at the Palm Beach Campus and will assist with both academic and student organizations. Prior to joining NSU COP, Elharar practiced in the community pharmacy and the long-term care pharmacy setting, gaining experience with diverse patient populations and compounding. Fabiana Ospina, joined the experiential education department as administrative coordinator I at the Palm Beach Campus. Ms. Ospina will provide support to faculty, preceptors and students in introductory and advanced pharmacy practice experiences. She is pursuing a bachelor’s degree in biology and believes her love of health sciences and academics coalesce perfectly with her position at NSU. Adrian Phen, M.B.A., was appointed assistant director II, graduate admissions. Phen received his B.A. in criminology from the University of Florida, and his M.B.A. from NSU. Prior to joining the COP, Phen was assistant director II with NSU undergraduate admissions and brings to COP his knowledge and experience working with a diverse student population. In this role, Phen will develop, implement, and manage recruitment efforts of the college. Joanne Schrager, joined NSU COP as accounting specialist III. Her primary responsibilities will be daily financial transactions including accounts receivables and expenses, Kronos payroll coordination, and student employment. Prior to joining NSU Schrager was senior accounting clerk for the City of West Palm Beach, financial reporting manager for Oracle America, and accounting specialist with the Broward County School District. NSU COP celebrated 30 years of excellence (1987-2017) on November 4, 2017. 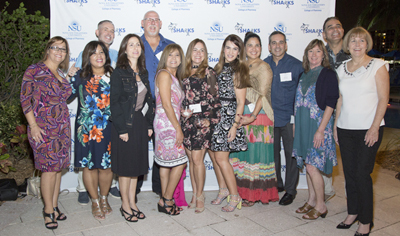 Alumni and friends joined us at the Doubletree Hotel in Hollywood, FL, to celebrate this milestone and reconnect with classmates. The evening started with a poolside reception, followed by a warm welcome by Dean Lisa Deziel, Ph.D., and Frederick Lippman, R.Ph. Ed.D., interim executive vice president/chief operating officer, and live entertainment. The charter class of 1987 was well represented. We look forward to seeing even more alumni at our upcoming events. Jonathan Marin, Pharm.D. ('13), and Laura (Llamazares) Marin, Pharm.D. ('13), first met during orientation 2009. At the time good conversation, laughs, and mutual friends seemed all that the friendship would bring. Both grew up in Miami, FL, so finding subjects in common was easy. In their second (P2) year something wonderful began, and in spring 2011 they started dating. Three and a half years later, in November 2014, Jonathan proposed on top of the Sears Skyview Tower in Chicago, IL. 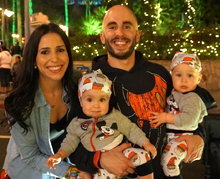 The couple married in August 2015, and are now the proud parents of twin boys Maddox & Landon. Jonathan is the staff pharmacist at Walgreens and Laura is the assistant pharmacy manager at Publix with a per diem clinical pharmacist position at Hialeah Hospital. The couple credits NSU COP for being instrumental in bringing them together. Share your love story with us at copalumni@nova.edu. Scott Miller, Pharm.D., is director, enterprise specialty reporting at AllianceRx Walgreens Prime. Richard Ashworth, Pharm.D., named president of operations at Walgreens. John Michael O’Brien, Pharm.D., M.P.H., deputy assistant secretary for health policy at the U.S. Department of Health, presented at NSU COP sharing his story “From Student to Alumni to Practicing Professional”. Richard J. Weisler, Pharm.D., MBA, director, medical affairs at Seattle Genetics, presented at NSU COP on Exploring Pharmacy Professions “From Student to Alumni to Practicing Professional”. Bryan Wilson, Pharm.D., is now at the Indian Health Center, Tucson, AZ. 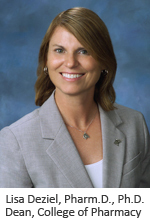 Alicia Harvey, Pharm.D., BCPS, is a clinical pharmacy specialist at Broward Health, FL. Oren Elharar, Pharm.D., instructor/academic facilitator, Palm Beach Campus, and his wife Nicole (Ganzer) Elharar (’12) welcomed their second child, Ella Shira on January 26. Ella joins big brother Ethan. Carolina M. Guiterrez, Pharm.D. clinical pharmacists at Memorial Healthcare System won the Patient First Award at Memorial Hospital Pembroke. Bernard Laguerre, Pharm.D., passed away in October, 2017. The College is pleased to host two pharmacists from the University of Ilorin Teaching Hospital, Ilorin, Nigeria, Joseph Oladele Ole, Pharm.D. and Bello Ibrahim Kolawole, M.Sc., Cl. Pharm. The pharmacists will spend one month with college faculty and administrators observing and participating in the day-to-day activities of the college, including visits to hospitals, clinics, and attending college and university programs such as continuing education: genetics and medications, and HPD research day. The visit is in partnership with the International Pharmaceutical Federation (FIP) Pharmabridge Program which aims to strengthen pharmacy services in emerging countries, foster communication and exchange of information, resources, and experiences between pharmacists, pharmaceutical scientists, and pharmacy educators from all corners of the globe, leading to better pharmacy services, improved patient care, and enhanced community health. Matthew Seamon, Pharm.D., J.D., chair of pharmacy practice, Stacey Maravent, Pharm.D. (’02), director of experiential education, and Kimmi Stultz, Pharm.D. (’07), director of preceptor development, visited the United Kingdom (U.K.) in November 2017 to develop international APPE opportunities. 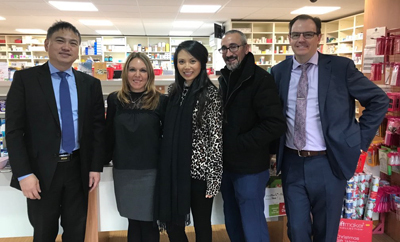 The team met with Lo’s Pharmacy in Barnsley, England, and Boots Walgreens Alliance in Nottingham, England. NSU COP is offering an APPE block in 2019 giving students the opportunity to learn about healthcare in the U.K. Students will live and study in the U.K. for 4 weeks during the 6 week experience and have the opportunity to spend time with area and multi-site managers learning about compliance standards, administration, invoicing, etc. Pictured (left-to-right): Steve Lo, Owner/Pharmacist, Stacey Maravent, Kimmi Stultz, Matthew Seamon, Paul Mason, Superintendent Pharmacist. The College of Pharmacy’s annual travel study program will take place this summer in Spain. The 3 credit hour elective course will run May 14 - August 19, 2018 with tentative travel dates June 8-24, 2018. 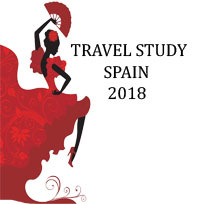 The travel portion of the program will include the cities of Madrid, Salamanca, and Granada, and include lectures, course work, and cultural experiences. 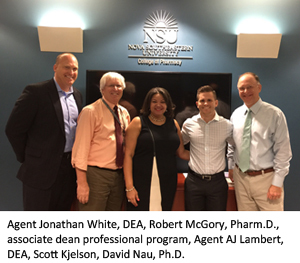 The program is open to College of Pharmacy students at NSU as well as students from U.S. accredited pharmacy schools. For more information, visit the Global Engagement website. 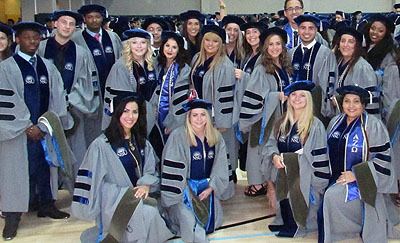 A new national study of U.S. colleges and universities found that Nova Southeastern University (NSU) is rated 5th for the overall number of minority graduate degree recipients, according to Diverse: Issues in Higher Education. The 30-year-old publication provides news, commentary and insight on the full range of issues concerning diversity in American education. NSU Recognized for Awarding Graduate Degrees to Minorities. In addition, on December 5, 2017, the Southern Association of Colleges and Schools Commission on Colleges (SACSCOC) reaffirmed NSU’s regional accreditation for another 10 years! NSU was compliant with no findings or recommendations. March 10 - 11: Continuing Education - Initial Consultant Pharmacist License and alumni lunch/social at the NSU Fort Lauderdale/Davie Campus. More Information. 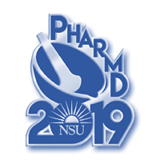 May 5 - 6:Continuing Education - 29th Annual Contemporary Pharmacy Issues for Pharmacists, and 29th Annual Contemporary Pharmacy Issues for Pharmacy Technicians and alumni lunch/social at the NSU Fort Lauderdale/Davie Campus. More Information. July 20 - 22: Continuing Education - Physical Assessment Institute in Patient Care Management and alumni lunch/social at the NSU Fort Lauderdale/Davie Campus. More Information. November 3 - 4: Continuing Education – Fall Classic and alumni lunch/social at the NSU Fort Lauderdale/Davie Campus. More Information.